I was walking along the streets of Vieste (Italy) with many thoughts for my upcoming interview with Miss Nice Girl, one of the many personalities of the summer. how did you get started in your activity as a one man band? ART: The weapons (instruments) that you carry around are your own inventions? 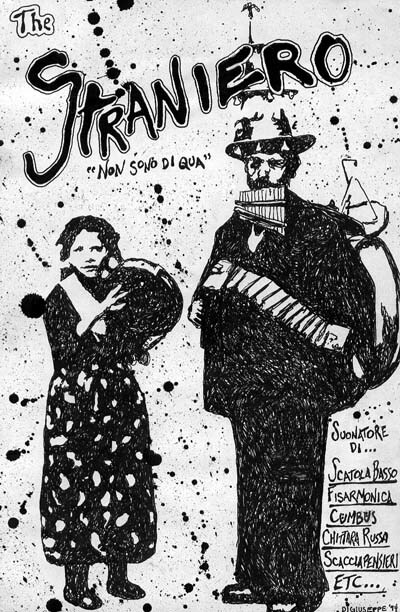 ART: Do you know another celebrated one man band, Edoardo Bennato? ART:Do you only do covers, or do you have some of your own pieces too? ART: In your opinion whats the advantage of playing on the street instead of more traditional venues? ART:In your opinion whats the street artists role in society? just having fun or, seeing as you play mostly in piazza, to be also a little politically involved sometimes? one thing that I always try to show the public is that with a little creativity you can do an awful lot! Artists who have been an influence on you in particular? ART: Have you ever had any problems with the authorities in your years and years of experience on the street? Its difficult to coordinate all these instruments together at the same time?